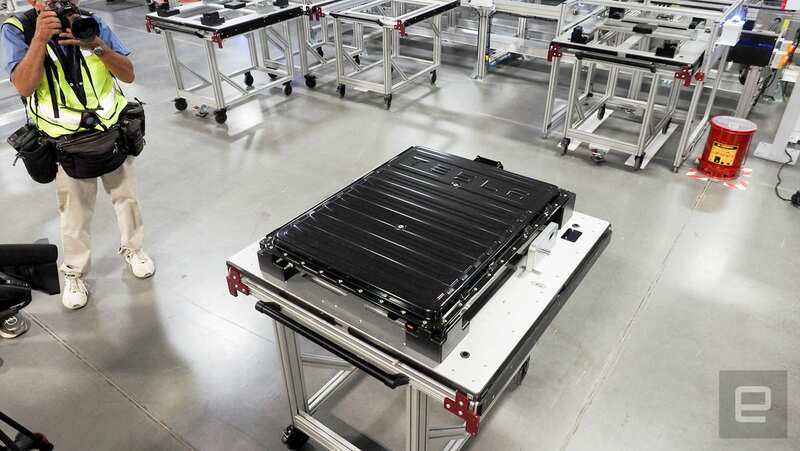 The automaker needs this factory’s batteries to succeed. Journalists sit in cars and a shuttle as a guard checks to make sure every passenger is on his list. They're the security guards for Tesla's biggest and most important endeavor, the Gigafactory. When completed, it will occupy space equivalent to 107 football fields. The automaker has invited us for a tour of the largest battery-manufacturing factory on the planet. To construct the enormous three-floor factory and meet the goal of producing 400,000 preordered Model 3s by the end of 2018, Tesla is building the Gigafactory in phases. A section is completed and equipment is moved in while the next portion is being erected. It's not so much a single building but a series of connected structures. Section A is already cranking out battery packs for Powerwalls. Sections B and C have battery cell manufacturing equipment being installed and are being primed for production. Section D has one exterior wall and floors, but it's still mostly steel girders and rebar. Meanwhile, two days before we arrived, work started on Section E, which is currently just a skeleton of steel. This section-by-section process continues inside. For example, the third floor will be one long cell assembly line. There's already one line installed and being prepped for testing. The next room over is being readied for identical equipment. And the next room over from that, and again, and again until the length of the third floor is a series of cell-producing juggernauts. With each new setup, the process will be tweaked based on what Tesla and Panasonic have learned from the machines already pumping out batteries. It's about optimization, according to CEO Elon Musk, something that been part of the factories' DNA from the beginning. 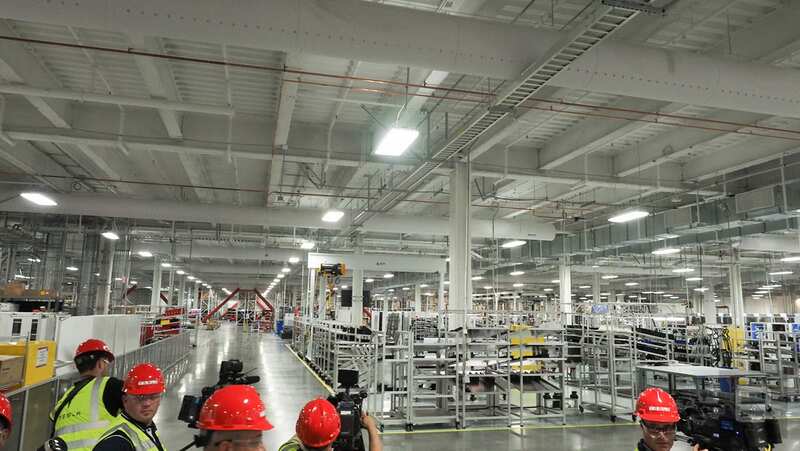 Since the original plans, the partnership has figured out that the Gigafactory will be able to produce three times as many battery packs as thought. But it needs to move quickly and start building the 400,000 preordered Model 3s. "We need to get roughly a third the size of the original building to support half a million cars a year," Musk said at the event. Those orders forced the company to push up its Gigafactory plans by two years, and now Tesla believes it can meet the production schedule for entry-level Teslas in 2018. 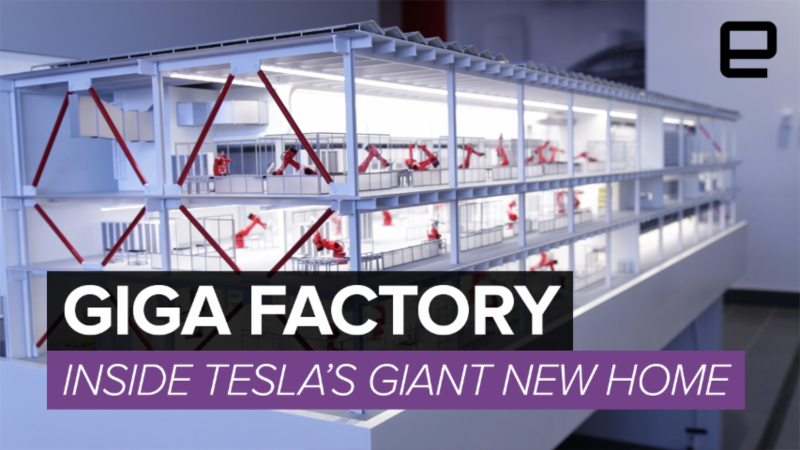 Musk notes that the Gigfactory is more than just a way to get batteries into its cars. He said, "the factory itself is considered to be a product. It's the machine that builds the machine and actually deserves more attention from creative problem-solving engineers than the part that it makes." Tesla will gradually transition a majority of its research to improving its factory's workflow. That efficiency will drive the battery price per kilowatt hour down at least 30 percent by 2020, according to Musk. It's all going to start in this already-massive Gigafactory, 30 minutes outside Reno. When complete, it will produce enough battery packs for 1.5 million cars a year. In 2015, Tesla sold only 50,580 EVs, which means it has plenty of room to grow. If demand explodes outside the United States, the automaker plans to open additional Gigafactories that will also build the automobiles. 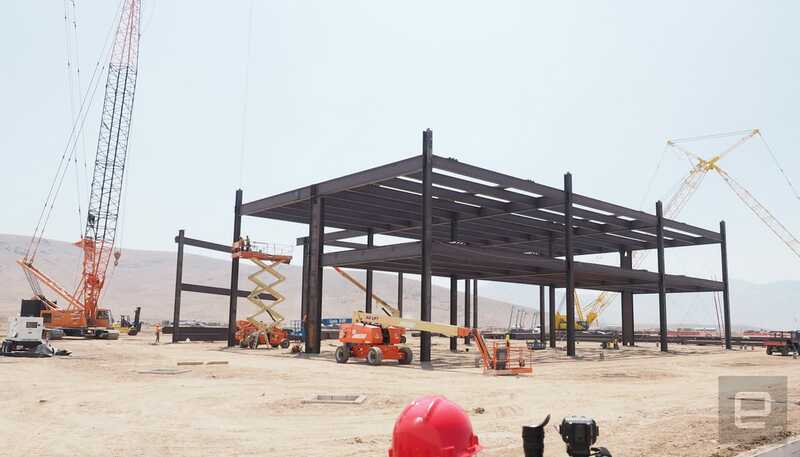 Today's factory -- even though it's not even 20 percent completed -- is a remarkable undertaking not only by Tesla, but by Panasonic, which jumped on board at the planning phases and hasn't looked back. And while the goal is to wean people off fossil fuels and get more electric cars on the road, the Gigafactory's output will be only for Tesla products. Other automakers will have to get their batteries elsewhere. Musk talked about the importance of being faster than anyone else. "Speed is the ultimate defense," he said. The CEO is acting more like an early settler out to get the best piece of land than the leader of a company. But it's not just about being first or the quickest to him. He seems to really enjoy what he's doing.